What&apos;s the best way to get to Denali National Park from Anchorage? Some of the country&apos;s most iconic national parks are within easy reach of Anchorage, including the towering peaks and amazing wildlife of Denali National Park. If you&apos;re under a time crunch, consider charter air service into the park companies like Kantishna Air Taxi can arrange special service from Anchorage to Kantishna inside Denali National Park. The flight lasts approximately 2 hours, and you&apos;ll need to make further arrangements for transportation around the park once you touch down. If you only have a few hours but still want to see Denali, consider booking a round-trip sightseeing flight departing from Anchorage or Talkeetna. You&apos;ll still get views of the mountain, and be back in town in time for dinner. If you want maximum flexibility, rent a car in Anchorage. It is five hours from the city to the park entrance, with most of the accommodations just one mile farther up the highway along the Nenana River. By renting a car, you&apos;ll be able to go at you own pace and stop wherever you see fit. Remember: private vehicles are only allowed on the first 15 miles of road inside the park during the summer. Beyond that, you&apos;ll need to make arrangements to hop on a park bus or another specially permitted vehicle to drive any further into the park. If you love rail travel or won&apos;t be renting a car, consider the Alaska Railroad. The train departs daily from Anchorage, arriving in Denali at 4 p.m. The trip north passes through the town of Talkeetna. The Denali depot is right next to the park&apos;s visitor center. You won&apos;t have to wait to see Mount McKinley either; many of the best views are along the way. Motorcoaches also connect the city and the park. Booking with these companies gives you a guaranteed seat on a motorcoach with an expert to do all the driving. Many cruise lines offer land packages pre- or post-cruise, so check with yours if planning to cruise Alaska. If you plan to travel to Denali, there are a few resources that may be helpful. While in Anchorage, visit the Alaska Public Lands Information Center at 4th and F downtown for information on all federal lands in the state, including the park. 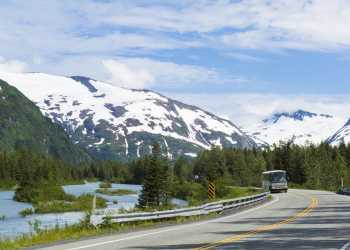 In print for decades and updated annually, The MILEPOST book, is the best selling travel guide to Alaska, with mile-by-mile descriptions of all major highways and roads in Alaska and northwestern Canada.